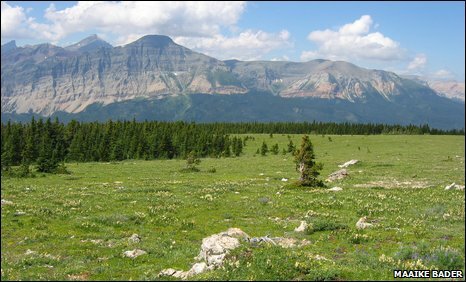 Smaller trees at the vanguard at Lee Ridge, in the Glacier National Park of Montana may be more than 50 years old. Trees around the world are colonising new territories in response to higher temperatures. From the US west coast to northern Siberia and south-east Asia, trees are growing at higher elevations, and at higher latitudes as the climate warms. Of 166 sites studied, trees are advancing at more than half, while they are receding at just two sites. The shift is revealed by the first global analysis of treelines published in the journal Ecology Letters. However, the trees aren't responding quite how scientists expected. Instead of advancing as summer temperatures rise, the trees' ability to colonise new areas appears to be more dependent on whether winter temperatures warm. Treelines tend to form wherever conditions for growth become too harsh. 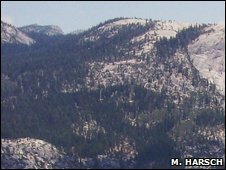 For example, at high altitudes and latitudes, the climate often becomes too cold for trees to survive. At this boundary, a treeline occurs, with forest on one side and shorter, hardier plants such as shrubs and plants on the other. However, around the world, average air temperatures have risen during the past century. This warming has been most pronounced at high altitudes and latitudes, the exact places where treelines form. So in theory, trees should take advantage of these warmer, more hospitable climates, allowing treelines to advance higher and closer towards the poles. In reality though, the picture has been more complicated. In some places, trees have advanced higher up mountains or further north, but in others they appear not to have moved. 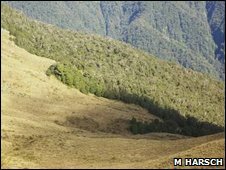 To better understand what is going on, Melanie Harsch of the Bio-Protection Research Centre at Lincoln University in New Zealand and colleagues conducted a meta-analysis of a global dataset of 166 sites around the world at which treeline dynamics have been recorded since 1900 AD. When they analysed this data, the researchers found that air temperatures had increased at 111 of 166 sites, at an average rate of 0.013 degrees Celsius per year. Summer warming occurred at 117 of the sites at a mean of 0.0189 degrees Celsius per year, more often than winter warming which occurred at 77 sites at an average of 0.0199 degrees Celsius per year. Most important, they found that treelines had advanced into previously inhospitable habitat at 87 sites. The treelines remained stable at 77 sites, while trees had retreated at just two locations. Crucially, the trees do not seem to be responding to warmer summer temperatures. "We expected growing season warming to be the dominant driver," says Harsch. "But we found that it was not, winter temperature was." That could be because trees that have advanced during warm summers can more easily survive the odd cooler summer. Whereas those that advanced during warmer winters may not survive a particularly cold winter, making winter temperatures the limiting factor. Also, the researchers found that diffuse treelines, where the number of trees growing gradually peters out, are much more likely to advance than abrupt treelines, which form when trees suddenly stop growing at a certain altitude or latitude. That could be because other stress factors, such as wind abrasion, snow and ice damage limit the spread of species which create abrupt treelines. WEDNESDAY : What did the Copenhagen climate summit achieve?